Christmas is coming and I’ve been in a shopping mood all week long! So while visiting our favourite neighbourhood pet store yesterday, I simply couldn’t resist getting this adorable cat tee for Benji! It’s been ages since we got him any new toys or clothes and the tees were so cute and colourful that I ended up indulging Benji with one, as an early Christmas present! I initially got him a Liverpool tee as B was feeling somewhat down and I thought of cheering him up by turning Benji into a Liverpool cat for the night. My plan fell through though as the tee was a size too big for Benji. I returned to the store in hopes of exchanging it for a smaller size but they were out of size 7. They did however have MU and Arsenal tees in size 7, but obviously that wouldn’t work for B, being the devoted Liverpool fan that he is! 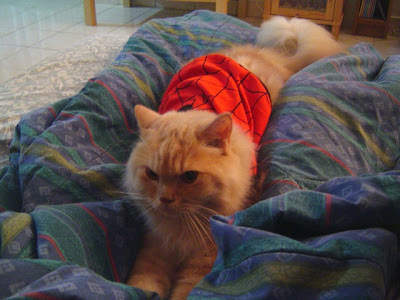 So after rummaging through all the available choices, we decided to turn Benji into Spidey instead! I love the red against his golden fur; doesn’t he look adorable? Speaking of Christmas, I’m eagerly anticipating the arrival of the new perfume sets that will be out during this festive celebration. It’s been ages since I added a new fragrance to my collection so I’m really excited to see what’s in store for me this Christmas, which is why I'm delighted to come across Coupon Chief! This site offers you a complete online coupons and discount solution to help you do your Christmas shopping with ease, in the comforts of your own home. What caught my attention however were the 2 perfume sites I discovered here. Perfumania.com coupons is offering a great free-shipping coupon on orders of $59 or more while Perfume Country deals beckons me with an awesome discount of up to 50% for ANY perfume of my choice! For a perfume lover like me, this is wonderful news indeed! Oh and a very nicely written paid post btw. The perfume lover is out for another perfume shopping spree! Enjoy yourself yeah? Hi Marzie, cute cat Tee and i like the sipderman design. One of my favourite superhero. Christmas is coming! Yeah! Miss your comments on my blog... Cheers! who is tht lucky person? did u publish the winner? eagerly awaiting to know abt the results. pls do suggest me some brands. plsd let me know & guide me....also pl tell me if those websites will give 50% discount on genuine peice & will there be delivery available to india????? who ever wins is really lucky..
Benji is too much lah. How come he look so cute in superhero T.
And how come u buy only for Benji? What about chubbs my anak manja? Hola Marzie! Benji looks super cute in the tee! Ya la..wanna see Chubbs and Phoebe in their tees too! Having pets can be a handful, so it's best to save that pet dream for later, perhaps when your daughter is a bit older. I bet she'd love to own a cute kitty cat! Waah! now we have Spider Cat! Have a great week-end! PS. Benji is a he actually LOL! Being a cat myself, I wonder if they have one in my size? 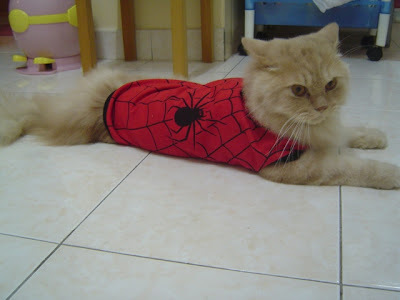 Spidercat Hollydale! hi handsome! aunty emila got to run fast, see you in a jiffy! hehhe... pat pat hensem gak... bubye!! Amboi bestnya.. stretch like that on the bed.. hehe..